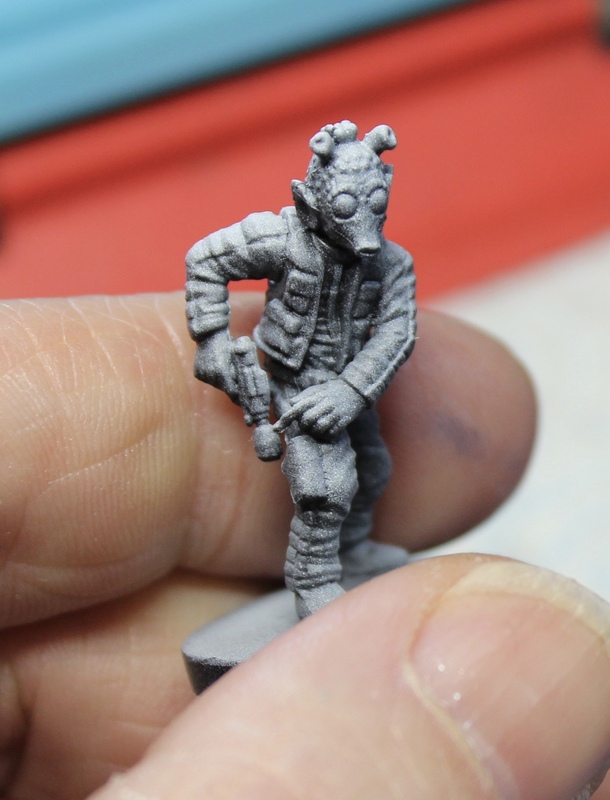 28mm Victorian Warfare: Who shot first? Greedo, a Rodian Bounty Hunter, was one of the second wave of action figures that young Master Awdry readily exchanged for his pocket money. Like many other small boys at the time, I was mesmerised by the Cantina scene in Star Wars. The fleeting glimpses of so many wondrous beings were almost too much to assimilate, but with their immortalisation in plastic, we were able to relive our favourite scenes over and over again. In fact, the only difficulty was deciding which one of the many alien creatures to collect first, Greedo, Hammerhead, Walrusman or perhaps even Snaggletooth? Not surprising then that this was one of the Imperial Assault miniatures that I was really looking forward to painting, not least because sculpt for Greedo is a real belter, with the Bounty Hunter in mid draw; although one hopes that the outcome is slighter better than in the film. When it came to painting, I hurried off to the appropriate Sorastro tutorial and was guided through the intricacies of zenithal highlighting, another new technique for me! Slowly, but surely, the character started to emerge and again, I have nothing but praise for the clarity of Sorastro’s presentation. As with previous efforts, Sorastro’s calm and methodical approach resulted in me producing something that I was truly happy with, the man is certainly a talent. With another miniature safely finished, please excuse me as I indulge myself with a bit of a rant! Never has there been a clearer insight into a hero’s character than when Han Solo is cornered in the Cantina by Greedo. A tense passage of the film ensues, revealing a little of our hero’s back story. Knowing that there is no way out, the smuggler carefully releases his blaster from its holster before terminating the Rodian’s contract. There is no doubt in my mind that Han Solo does what is required, in fact, the question itself, who shot first? is somewhat redundant, as there is only one shot and the man who fired it, gets up and walks out! Thank you Andy, I think my first was Solo too, with a small head! He sadly was lost and his replacement was never the same. A very nicely done figure. What's this star wars stuff you are going on about? Thank you Dan, it might be that you are one of the few souls that has escaped the phenomena! Thank you and good point! I think Solo was the same in his thinking, why wait? 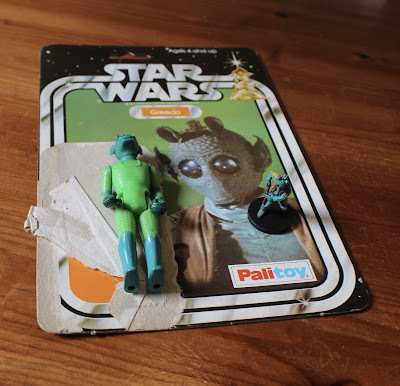 Thank you Dave, I remember doing a double take when first seeing what looked like Greedo at the palace. That revision sums up why I walked away from the Star Wars universe. I saw the dodgy CGI head weave and decided that was the final straw for me. Surely you mean Darth Binks? That is a priceless theory, my worry is that Disney might actually make it happen! Of course Han shot first - what sort of rube would he have been not to? Great looking figure figure Micheal! I'm not a fan of the pc view of the world so completely agree Han shot first. Sadly pc has completely overwhelmed the Disney SW putting a huge wet blanket over it. Thank you Christopher, things have certainly moved on since 1977, but not all for the worse, I like to think. Thank you Joe, certainly one of my favourite sculpts so far. Nice mini and great job Michael! Stevie and myself have, I think, every edition ever made for these films to be released (some on old VHS as well). For me I enjoy something from each Lucas rendering and his endless tittervating of details and effects. Like the edition wars in Dungeons and Dragons, or the arguments over old Doctor Who and Nu-who... I stay completely clear of it, and instead just enjoy each rendering for what it is. However, yes I would have to agree, there is no doubt Solo fired first BUT most people have forgotten the best Lucas render of all (which never stayed on VHS for long and was replaced quickly with the Anniversary edition, so most never even saw it) where Solo fires near as damn it simultaneously as Greedo, and you actually see the two laser flashes.. one going over Solo`s shoulder. Your painting of Greedo is masterly and wow he looks so realistic. We own the original Rebel Storm version from WotC Star Wars Miniatures Skirmish game.. all of the miniatures of which came pre-painted for that game, and are, for the most part, the same ones as now used in FFG`s Imperial Assault only now unpainted, and some with a few adjustments to pose, like the new Greedo. Thank you so much Hils and you are of course absolutely right. Which of us hasn't thought about the idea of revisiting work or ideas and tinkering with them so that they match are original expectations? That's a work of art, so it is! Of course Han shot first! The bounty hunter was monologuing - and we all know that makes him stupid as well as evil :-) . hehe I always think sadly about Phantom Menace, and Greedo as a little kid with his whole future (and life) ahead of him... as he`s supporting Anakin at that all important Pod Race. What turned him from that sweet tiny kid, into the killer he became. Thank you, I have looked longingly at those Black Series figures, they are stunning. Who shot first?..as the actress said to the Bishop. Lovely paint Job..especially the blue/Green. 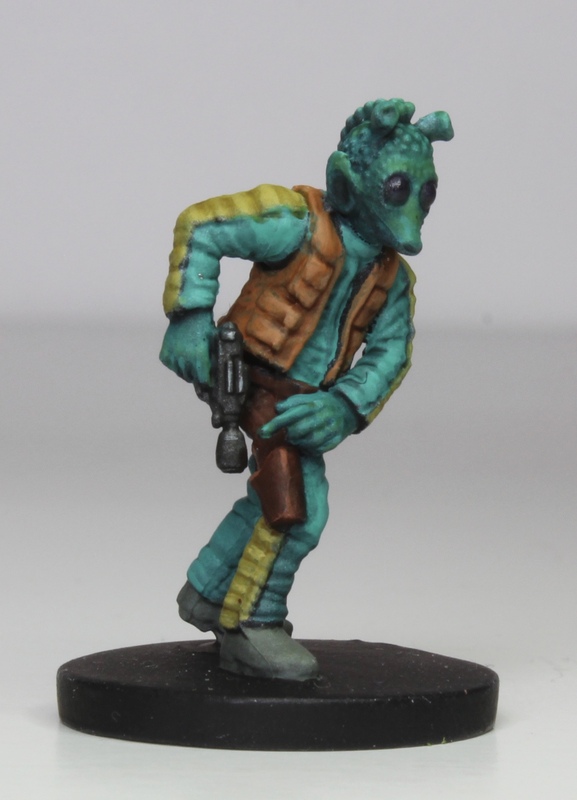 Greedo looks perfect. 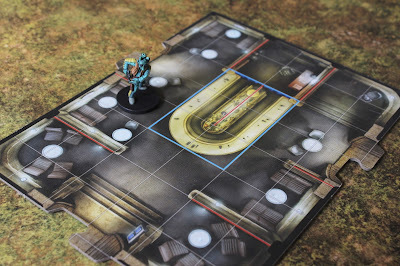 Your paint tutorial vids are really adding a new level to your pieces in this SW range. Anti-Hero is exactly the right term, he was a smuggler used to operating on the wrong side of law. That was always part of the charm of the character. As for the videos, I can't recommend them enough. Then I hope you get to see Solo. It has fast become my favourite SW film of all. Had all of the SW elements I had ever wanted both as a child, or an adult. Beautiful work Michael, and Han shot first!! HAN SHOT FIRST! Basta, oh and I have the T-shirt to prove it! Couldn't agree more! A T-shirt you say, now there is dedication to the cause. Beautifully rendered mini, Michael. The cantina scene is one of my favourite movie moments too. Here's another rendition of it, by Weird Al Yankovitch. 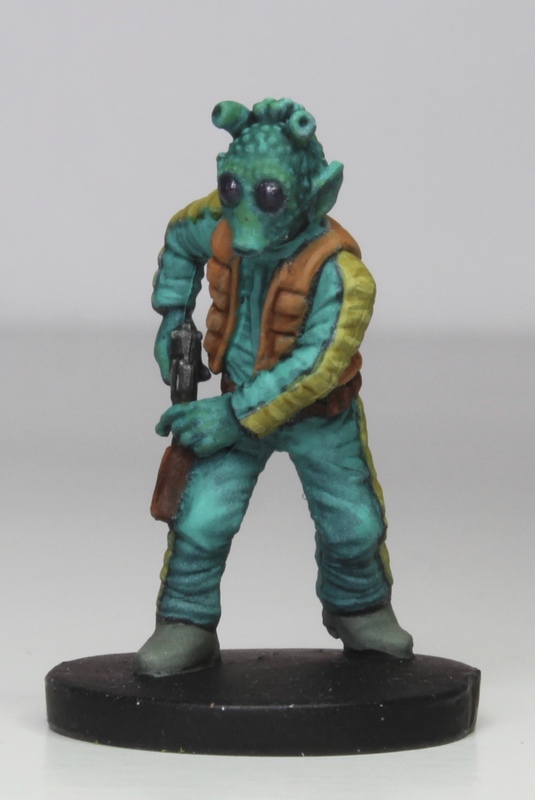 No Greedo, but enjoy! Thank you A.J. and for the link too, what a gem that is! Fantastic work as always Michael! What a great month! Thank you Michał, hopefully a couple more posts to go. Ace job on old Greebo! I love the scum and villainy from the Star Wars universe probably more so than the actual Empire. I think I might be with you on that one Simon. One can only hope and thank you. Great work. I remember the first five figures I got for my birthday: Darth Vader, Chewbacca, Luke Skywalker (X-Wing Pilot), Boba Fett and a humble Stormtrooper. I was a lucky little boy. You were a lucky boy, what a starter set! 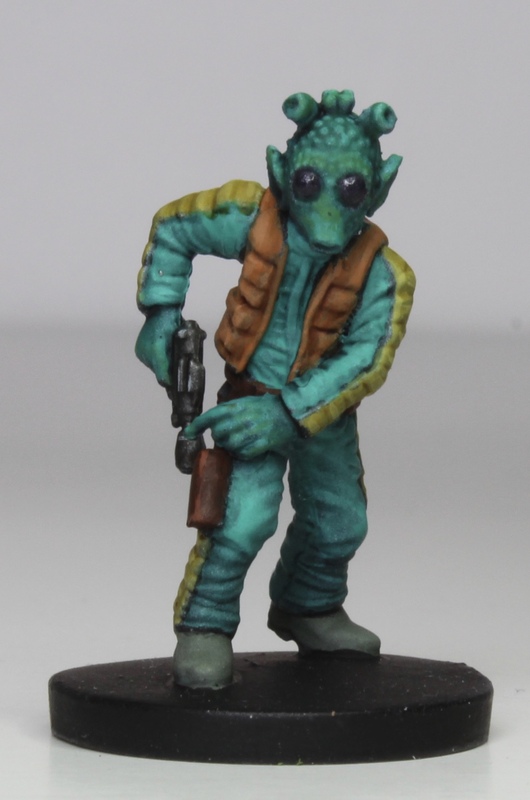 Excellent work on Greedo Michael. 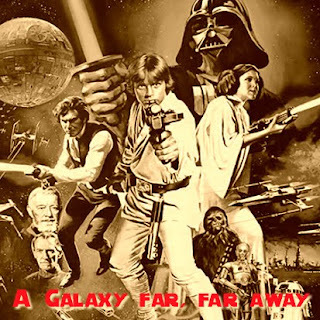 I've watched a couple of Sorasto's you tube vidoes on zombies, may need to indulge in some Star Wars ones now. Thank you Terry, funnily enough I have just been looking at the Zombicide ones and might have to try the strong tone dip as a result. Thank you so much, this was a little gem to work on, really great fun. Thank you so much Barks. Oh wow! That's some cismic painting there Sir M! That is very kind of you Ray, thank you. Thank you Dean, the eyes were done by adding a little silver to mix. Another beautifully painted figure, Michael, and much beeter than the awful 'shades of green' of the original action figure. Although, nostalgia does kick in whenever I see one of these figures. Top notch painting Michael! Really liked the scene when I was a kid and yes I too think it was more fitting for Solo shooting first. The contrast you managed to bring out via paint in him isn't easy ... great job Michael! What an absolutely brilliant looking miniature, well painted sir! I never watched the remastered version so for me there is no doubt who fired the first shot. "What a desolate place this is." These ARE the droids you have been looking for.